Not interested in the same old wedding transportation? Long Branch Trolley Company is the answer. There is no better way to roll up to your ceremony or reception than in one of our festive red trolleys decorated beautifully with white wedding bows. There is room for all of your belongings, space in the back for a cooler and you can take beautiful pictures inside and out. We are equipped with heat and AC to keep you comfortable year-round. Our trolleys can seat up to 26 passengers, we are fully inspected, insured and our drivers are properly licensed. We arrive on time and will attend to your every need. Your wedding transportation may seem like only a minor detail until you consider that the quality of your wedding transport could make or break your big day. If you settle for a traditional wedding limo, you will be missing out on the one-of-a-kind photo opportunities that the Long Branch Trolley Company allows. Our wedding trolley service has become very popular in the area and a charming, dependable alternative to a wedding limousine or typical wedding shuttle. A trolley rental from Long Branch Trolley Company guarantees you a truly memorable experience. 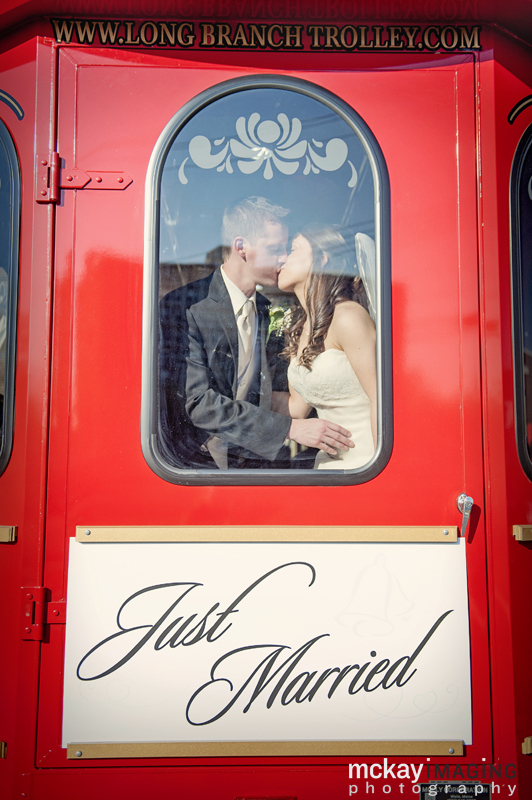 At Long Branch Trolley Company we create a completely personalized experience for the happy couple. When you call us to arrange your wedding transportation you can expect our professional and courteous staff to work with you on planning every detail in advance. We want to give you a fun, well-rounded experience that you will always remember. We’re happy to accommodate special requests for photo opportunities, even making special stops to take photos at your favorite places. We’ll also decorate your wedding trolley with white wedding bows on the outside at no extra cost! When you are looking for the one-of-a-kind wedding transportation that a regular wedding limousine simply can’t give you, rent a trolley from Long Branch Trolley Company! Reach us by phone or e-mail today to book a reservation. Don’t forget: We’re available for other special events and parties, too!